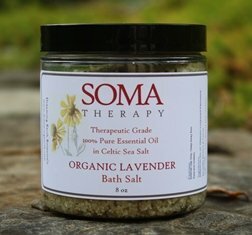 Our Organic Lavender Aromatherapy Bath Salts are made with Coarse Grain Celtic Sea Salt (imported from France), our exquisite SomaTherapy Organic Lavender Essential Oil and dried Lavender flowers. These aromatherapy bath salts are made with the finest lavender available, our organic Lavender Provence. The aroma is deliciously smooth, sweet and relaxing. Treat yourself to a refreshing, uplifting, relaxing bath after a hard day at work.